if they say "plastic safe"). works well). With a can of compressed air (I use a compressor set to 20psi) blow the surface dry. Rule #2: Don't over-do the chemicals. 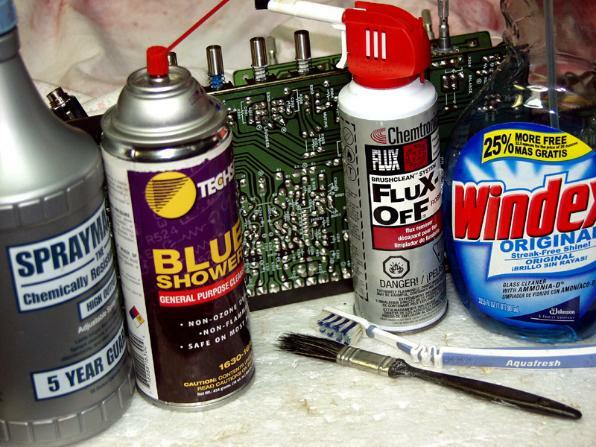 They are expensive and can affect the conformal coating. covers, knobs, etc... Over-spray and splatter from chemicals will mar surfaces. from the top down. Immediately, spray with the Windex. top. It forms a nice safe barrier between the board and the solvents. the whole process for each section..